It seems incredible that the Windcheetah is now in its 23rd year, and during that time the Windcheetah has remained at the very top of most recumbent enthusiasts wish lists. Or maybe that isn’t so surprising… The Windcheetah still remains the only trike to have set six significant speed and endurance records as well as having the honour of being exhibited in the Museum of Modern Art and the Guggenheim museum. The Windcheetah has now rightfully achieved an almost iconic status in the world of performance cycling, and proud owners the world over use their Windcheetah for racing, touring, commuting or purely for exercise and pleasure. The Windcheetah has maintained its lead in the market through a process of carefully planned evolution. AVD have strived to continually improve the product without altering the purity of Mike Burrow’s original classic design. 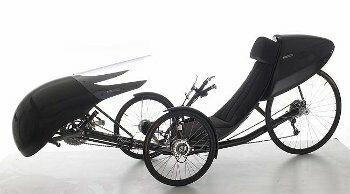 After 21 years of continued success both Mike and AVD decided that the time was right to set a new benchmark in recumbent design and launch a completely revised Windcheetah; The Windcheetah HyperSport. Instantly recognisable as a Windcheetah, a closer inspection reveals a myriad of detail design changes and cutting edge engineering innovation. These exciting new features collectively ensure that the Windcheetah’s position as the high performance trike remains uncontested. The HyperSport will be sold in limited numbers alongside the world famous ClubSport and SuperSport models. The Windcheetah has a lightweight cruciform chassis made from aluminium tubes. The tubes are bonded together using a series of cast aluminium lugs. The backbone of the chassis is a single piece of 2″ [50mm] tube. The front casting forms the bottom bracket for the chainset and the rear casting houses the bearings for the rear axle, which is cantilever mounted and offset to the left of the machine. This unique feature allows the use of the one piece main tube giving a light stiff structure uncompromised by welded joints. The steering is via a joystick connected through a universal joint to the track rods. The joystick turns around its own axis to provide a light ,precise steering action. All the major controls are mounted on the joystick, with the exception of the parking brake, which is mounted under the seat. The front alloy drum brakes are linked and provide efficient, powerful stopping ability. The parking brake is a simple friction lever operating on the rear tyre. Please note these may alter from time to time. Equipment Shimano Dura Ace 9sp shifters, Shimano 105 triple chainset [52.42.30] 9speed LX cassette 11.32, Shimano 105 front and rear derailleur mechanisms. Alternative gearing can be specified if required, please ask. Tyres Continental Sport Contact. Front 406x 25, Rear 559 x 25. Other tyres can be specified if required, please ask. Seat Carbon fibre , fitted with washable high-density foam three-piece cushion. Specifications may alter from time to time subject to availability, please check at time of purchase. The HyperSport has many detail differences to the SuperSport and ClubSport featuring various weight reducing modifications such as drilled out chain pulleys , relieved steering tab etc etc. It also features left and right hand threaded micro adjustable track control arms. Equipment Shimano Dura Ace 9sp shifters, Shimano Dura Ace triple chainset [53.39.30] 9 speed Dura Ace part titanium cassette 11.28, Shimano Dura Ace front and rear derailleur mechanisms. Alternative gearing can be specified if required, please ask. Rear Axle Hollow HE 15 aluminium.